of whole foods & juice. Come join us at Sirona where you will discover your true empowered self. The Sirona cleanse and flush is a mild and easy to follow cleanse that achieves optimum results. 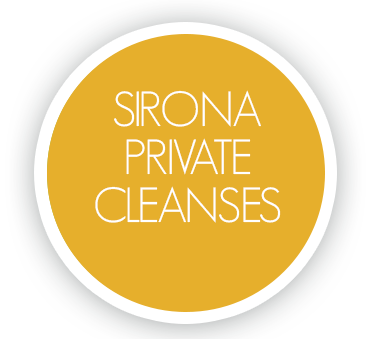 Whether you’re a newbie to cleansing or a pro you will find the Sirona cleanse to be a refreshing and rejuvenating approach to cleansing. 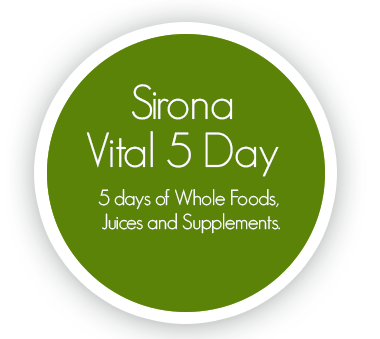 At Sirona we begin and end your cleanse with prepared delicious alkalizing whole foods and juices that are 100% vegan and completely gluten free. All of our meals are designed to be eaten separately and in a specified order. Each day you will receive instructions on how to eat and take your vitals. Each meal is formulated to nourish your body with essential vitamins, minerals, enzymes and amino acids to promote proper digestion while preparing your mind and body for the flush. On the flush days Sirona gives your entire body the vacation it deserves as we flush toxins through organs, tissues and blood with specially prepared juices and broths. After flushing we end your cleanse with beautifully flavored vegan and gluten free whole foods packed with vital nutrients that boost your energy and make you feel like a Rockstar! All food and juices are served in glass containers and prepared in 100% stainless steel. Everything you will need for your cleanse and flush from foods, juices, broths to supplements are included. Why do the Sirona Cleanse & Flush? Are you feeling toxic, a lack of energy, and bloated? Do you know that your eating habits are not good for your body? Do you ever think about how the toxic environment that we live in could be affecting you? Would you like to lose weight and restructure the way you eat? Are you having trouble digesting dairy and gluten? Is what your eating having an effect on the way you think about yourself? Are you having severe mood swings and food cravings? Would you like to change your patterns and feel an increase in energy? Do you want to build a stronger immune system? Would you like to jump-start your digestion and give your body the vacation it deserves? Would you like to achieve this in a natural and gentle way without extreme fasting and withdrawals? Cleansing & what it will do FOR YOU! Toxicity occurs on two basic levels external and internal. We acquire toxins from our environment. Our society subjects us to a multitude of toxins on a daily basis chemical air and water pollution, radiation, and nuclear power. Everyday we are subject to ingesting and adsorbing chemicals through our every breath, thoughts, what we eat and what we put on our bodies. When these free radical substances, molecules, and toxins are not eliminated they can cause irritation or inflammation of cells and tissues, therefore blocking normal functions on a cellular, organ and whole body level. Microbes of all kinds-intestinal bacteria, foreign bacteria, yeasts and parasites produce metabolic waste products that our bodies must handle. Side effects from this toxic build up can be headaches, fatigue, pain, gastrointestinal problems, infections, obesity, allergies, skin irritations hormone imbalances and on a grand scale toxicity diseases such as cancer and cardiovascular disease. Detoxing is the process of eliminating built up waste, dirt, mucous, sludge, fluids, and toxic chemicals, poisons and harmful residues from our bodies. The waste is found in your fat, muscles, organs, cells, and all the places in between. What does a Cleanse and Flush do? The idea behind cleansing and flushing is to neutralize, transform and eliminate the toxic waste your body has accumulated. Cleansing and Flushing promotes the vital organs ability to eliminate toxic build up therefore absorbing more nutrients while aiding the body to heal, rejuvenate ultimately preventing degeneration and disease. Why do an Alkaline Cleanse? Due to our eating habits most of us are too acidic leaving our PH off balance. The imbalance of acidity in our bodies causes congestion, irritation, inflammation and the breakdown of tissues over time. Our bodies want to be more alkaline for best overall health. The Sirona Cleanse is designed to promote an 80% alkaline 20% percent acid ratio.